Priority 1: Looked after children and children who were looked after. Priority 3: Children whose main home address in located the school’s ‘catchment area’ and is reasonably expected to have a sibling at the school, at the time of admission will have a sibling. Priority 5: Other children whose main home address is located in the school’s ‘catchment area’. We accept children’s’ names for the nursery waiting list from their second birthday, however we can never guarantee a place. This is not ‘first come, first served’ but we try to offer all children three terms in nursery before they start school. Please note that a place at our nursery will not gain automatic entry into our school. An application form for the Nursery is available form our School Reception. To accompany your application we require a proof of address and a copy of your child’s birth certificate. We will make copies of these documents for you. If you have any queries then please call us on 020 7476 5336. 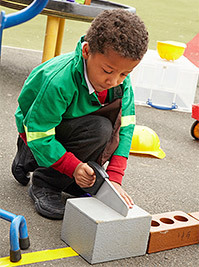 Click here for an overall guide to Nursery, Reception and Primary Education in Newham.